There are dozens of top players that will be a joy to watch as they play against the toughest competition in the Under-20 age group. Top prospects litter the Canadian and US teams, and the other world powerhouses have a full compliment, as well. Taking a slight departure from the annual WJC Darkhorses articles of the past where the Hockey Prophets tried to highlight the lesser-known players of the tournament, this year's preview includes not just the darkhorse types, but also calls out some of the bigger-name players that are of particular interest to the Hockey Prophets. The players noted below are broken down into three groups: the drafted, the draft-eligibles and the darkhorses. The World Junior Championships are often generalized as a 19-year-old players tournament and often the truth of that is evident not only in the players that each nation rosters, but those who make the biggest impact. This year's group should be no different, and players from the 2017 and 2018 NHL draft are likley to dominate the next two weeks of junior hockey. While some top-end prospects like Rasmus Dahlin, Andrei Svechnikov and Brady Tkachuk are not available because they are key contributors for their respective NHL teams, there are still plenty of prime prospects who should shine. Here are some of the players from that group that the Hockey Prophets are most interested in watching, and why. Brannstrom has long been a Hockey Prophets favoritte, and over the years he has continued to impress and improve his play. Brannstrom is quick and lively on the ice, moves well and he has an excellent passing touch. Hockey intelligence and superb on-ice vision and awareness are what truly sets him apart from the rest. He has the ability to see plays unfolding all over the ice, seems to know where everyone else is all the time, and perhaps more importantly, where the play needs to go to make the biggest impact on the game. He moves the puck to those spots and sets up his teammates for their best available chance with consistency. In his draft year, the biggest worries about Brannstrom were his size and his defensive play. Since then, he has developed his defensive play, and his smarts, mobility and anticipation remove any doubts about his chances of success as an undersized defender. Brannstrom was an alternate captain for Sweden in last year's tournament, and was among the best players not only on his team, but in the 2018 WJCs altogether. On a team with an incredibly talented corps of defenders as Sweden will be for this tournament, Brannstrom could again be a standout player and show the hockey world that not only is among the best of his age group, that he is also close to being NHL ready. Now that the 2018-2019 season has played through roughly the first 20 games of the season, it is time to take an initial look at how this year's rookies are faring, and who are the early Calder Trophy candidates standing out amongst their talented peers. The current group includes some richly talented players, including--remarkably--the top four draft selections of the 2018 NHL draft and the Hockey Prophets top overall forward prospect heading into the season. 2018 Draft: How Did The Teams Do? The NHL draft, a strange art form that combines a bit of science, a bit of experiential knowledge and a lot of pure luck, allows teams to resupply their prospect pools each summer. While it takes years for the results of the draft to truly clarify and all of the luck to play out, below is a compilation of each team's picks, and a short review of how NHL teams did over the draft weekend according to what the Hockey Prophets have seen in the tea leaves. 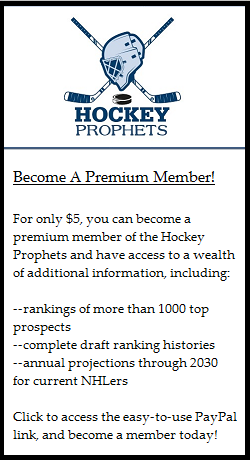 (Note that each player is listed with position, height, weight, A/P Score, Hockey Prophets draft ranking and weighted publication ranking). The Ducks added three centers in the opening three rounds. None of the three put up spectacular numbers in their draft years, but all showed solid hockey intelligence, decent skating and a willingness to play with energy in all three zones. Although the upside might be limited, all three have the potential for NHL play and could give Anaheim depth down the middle. Read more: 2018 Draft: How Did The Teams Do?